Holiday Rambler, Safari Sahara, Monaco Windsor, Coachmen Santara . . . there is no end to the number of different RV’s available out there. The trick is to discover which one is going to work for you. If you find that the RV lingo is more easily defined to you as gibberish than anything else you might want a crash course before heading out to find your Holiday Rambler Neptune, or Alfa See Ya, or Rexhall Rose Air, or whatever. First off; what is it you are looking for? Are you looking for an RV in place of your main residence? Are you looking for an RV to use once maybe twice a year to head out to parts unknown, but will need it easily stored the rest of the time? Are you looking for an RV that will sleep all 8 of your children? Are you looking for an RV that will accommodate the strenuous entertainment demands of teenagers? Are you looking for an RV that will provide you plenty of mobility once you get where you are going? Answer all these basic questions first and you’ll know what “type” of RV you need to go after: Holiday Rambler Diesel Pusher, or Skyline Weekender Travel Trailer. There are fifth wheels that leave you very mobile once you park and unhitch. There are Class A motorhomes that can provide you with more options and luxuries than most typical homes. There are pop up trailers that can be more easily stored than some family vehicles. If you can think of an option; it’s available. You just have to know what you need to ask for. Secondly, how much are you willing to spend? Find out what types of RV’s are out there in your price range. Holiday Rambler Diesel Pusher’s in inventory can range from $100,000 to $225,000. That’s a wide range and that’s all among the same class of RV. 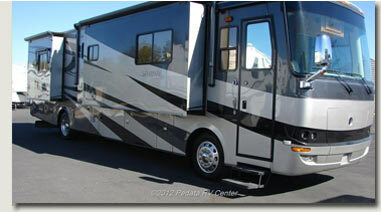 Holiday Rambler Class A RV’s in stock can range from $73,000 to $99,000. And that’s not all . . . Holiday Rambler makes fifth wheels. Holiday Rambler is one of the reputable, large RV names out there that can provide you with many options in many areas of RV life. The RV industry’s recent explosion has left consumers with limitless options. There are new RV’s of every shape and size with every option and luxury, and there are also just as wide a variety of used RV’s that will often enable you to get more for your money. The RV manufacturers have long since realized that their consumer base can be as wide as they plan it to be. More and more consumer groups have become interested in the RV lifestyle; whether it be a vacationing one or a new life altogether. This leaves RV dealers with near as many options as regular car dealerships so keep your eyes open for all those great deals out there. You might find that you can get a great deal on a new RV in the price range you have allotted yourself. You never know. Anything is possible. Third; who are you buying for? If you’ve got a family of eight make sure you are only looking at RV’s that can sleep eight. You don’t want to shortchange yourself and leave someone sleeping in a tent outside (unless they want to, that is). There are plenty of RV’s out there that can accommodate upwards of eight people; twelve is common enough and if you have need for more . . . just ask. Don’t look at a good deal on a Holiday Rambler towable if you don’t want to tow something. And don’t succumb to the temptation of purchasing a Holiday Rambler Diesel Pusher if you need the RV to be stored in your family garage. When we say the options are limitless; we aren’t teasing. Get what you want. Some consumers are willing to put near enough thought, energy and time into the design of their new, custom RV’s as they do into their home designs when building a custom house. Last of all, make sure that you take your time. If you spend a day RV shopping and you don’t see what you are looking for . . . don’t be frustrated. You just didn’t see it. That doesn’t mean it isn’t out there. Give yourself a break and come back for more. You might have overlooked the perfect RV or it might have cropped up in the night. As long as you are aware that the RV for you is out there you’ll be able to find it sooner or later. We’ll keep our fingers crossed for you that it’s sooner rather than later!